This is an excellent chance to buy some vintage industrial benches dating from the early 1950s. 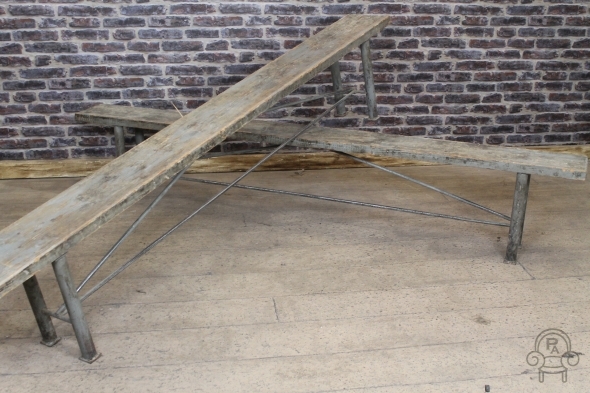 These Polish army benches have a tubular steel framework and cross stretcher, with a rustic pine top. They would suit any large kitchen, restaurant or retail outlet. The benches have a lovely warm paint appearance, which is all original, giving the pieces a really unique style. The items are in good condition, but please be aware that these are pieces of vintage furniture and may show some signs of general wear and tear; we feel this only adds to their character and charm. Please note: the price stated is for one of our vintage industrial benches only.